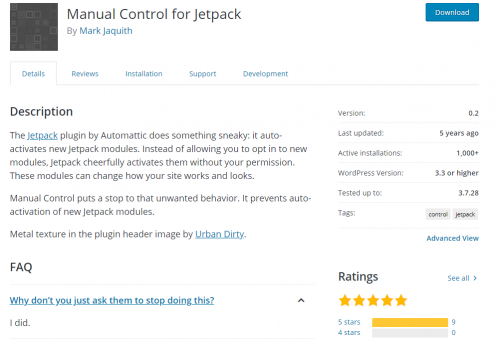 Below is the description for the plugin Manual Control for Jetpack. There is so much going on here that I’ve copied the text and taken a screenshot of the page. At some point the plugin will probably be completely removed. It is creepy how Jetpack does things like auto activating new modules whether you want them or not. As far as I can tell (from a recent conflict on a site where Jetpack decided to create sitemaps on top of the Yoast SEO plugin doing sitemaps), Jetpack must still be doing this yummy auto-activation feature. This is an OLD plugin that isn’t being updated. Not since WordPress 3.x. Does it still work? Does it have any discovered vulnerabilities? What happened to sites that were relying on it 5 years ago? Are they still around? If this plugin is no longer needed in a website (where it seems to be working), how does the site owner know? The Jetpack plugin by Automattic does something sneaky: it auto-activates new Jetpack modules. Instead of allowing you to opt in to new modules, Jetpack cheerfully activates them without your permission. These modules can change how your site works and looks. Manual Control puts a stop to that unwanted behavior. It prevents auto-activation of new Jetpack modules. Metal texture in the plugin header image by Urban Dirty. Why don’t you just ask them to stop doing this?